Our online Bootcamp programmes are similar to our half-day workshops but online. In 3 one-hour sessions attendees benefit from understanding exactly how they can leverage the power of LinkedIn. Recordings are provided in case you miss a session or you want to re-listen. The online sessions are held on three separate days to give you time to put into action the key points from each session. There’s zero theory and no technical ‘click here or this or that’. This Bootcamp is packed with real life examples of how this works and can work for you too. It’s not just a ‘what to do’ seminar but HOW you do it. It’s simple but you’ve got to know this stuff to get it working for you in your business. Even if you just implement half of what is covered you will reap extraordinary results. What could you gain by spending just 3 hours learning how to harness the most powerful and fertile hunting ground on the planet? The next Bootcamp series commences on Tuesday 20th October, continues on Thursday 22nd October and concludes on Tuesday 27th October. All sessions will start at 20:00 BST. Bonus #1 All sessions will be recorded for playback. Bonus #2 An MP3 download will be available exclusive to attendees for you to listen to at your leisure. 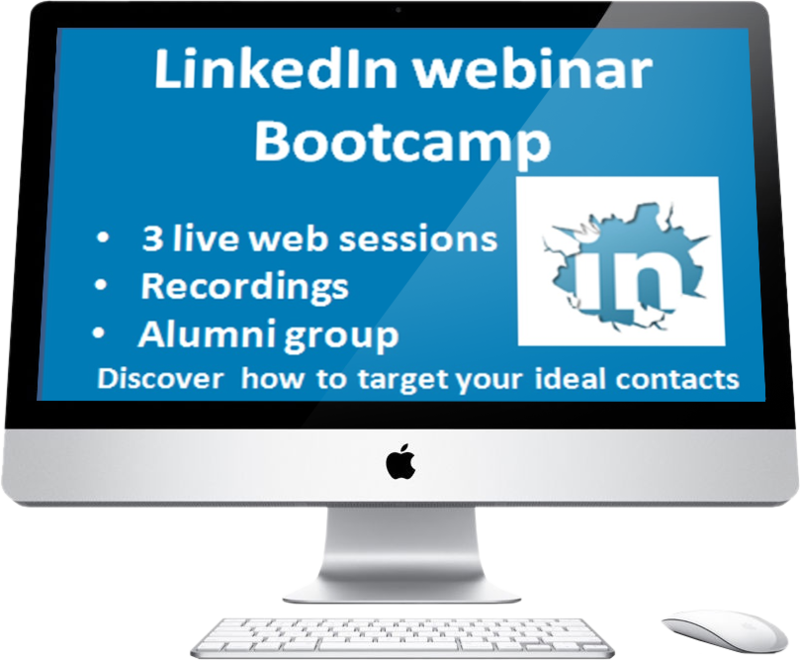 Bonus #3 All attendees will be invited to a dedicated private alumni LinkedIn group. Bonus #4 All attendees will be eligible for exclusive discounts on 1:2:1 and limited-size group 90-day coaching programmes. Your investment to attend is just £125 + VAT. To book click here or on the screen. If you defer to the next event a charge of £35.00 plus VAT to transfer is payable if notice of 1 week or less is given. Remember – all the sessions will be recorded and fully accessible to you for 6 months after the event.